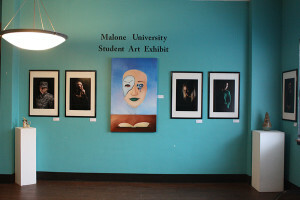 Seven students were the recipients of the 2019 Malone University Writers Prize. The prize, hosted by the Student Writers Guild, recognizes exceptional writing by Malone University undergraduate students from any major. Awardees will read their work during Canton's First Friday event at The Joseph Saxton Gallery on April 5 from 6-8 p.m.
First Prize: Emily Mattioli '19, of Moon Township, PA.
"Her Name Meant Home is a beautiful and moving piece drawn from the author's experience of living overseas and meeting Syrian refugees. It's woven together masterfully with poignant dialogue, vibrant description, and an ending that drives home the sorrow of longing for a home that is no more. The author offers clear depictions of life for Syrian refugees and manages to avoid sentimentalizing the topic resulting in a very effective emotional appeal that doesn't feel manipulative. Excellent work through and through!" Second Prize: Karly Bruce '22, of Palmyra, PA.
“The Camera Eye's strength is in the author's excellent descriptive voice. It addresses the topic of technology as a barrier to experiencing the wonders of God's creation and man-made beauty unfiltered and fully lived. The author’s ability to paint a picture for the reader and the well-constructed flow of the piece make it a pleasure to read." “Finding the Deltas explores the theme of water creatively in light of faith and Christian symbolism. Beginning by examining the concept of water in daily life the author moves into a reflection on life-giving and cleansing faith experiences. An engaging writing voice!" "Jairus Taylor’s poems fully invite the reader into their world, whether it’s a boxer getting lost in remembering his legendary bout or just a lazy holiday in bed. The tone may be casual, the references from popular culture, but carefully chosen are the 'flittiest song' and 'howevermany rolls' and 'all of my buddies / and all of their sugar sugars ah honey honeys.' I appreciated the poet’s attention to line break and willingness to experiment with syntax; the resulting group of poems is plain fun to read." "Michelle Brackett’s poems don’t look away from big questions or hard situations, taking them on through inventive figuration, see for instance, 'the beauty of a snake’s jaw / dislocating' or 'the great fortune / of a clean couch.' I was also struck by how different these poems were from one another, both in subject matter and in look on the page." "Boasting a strong voice and knack for mining a scene for its exact right details, Samantha Hudzik’s poems are 'the ugliest breed of gorgeous.' I really loved the way the poet invests intense emotional experiences, such as abandonment by a loved one or a holiday’s deep disappointment, with appropriate gravity, but also with the wry touch of humor." "Howell’s characters and their voices feel authentic with each line. He has a knack for choosing just the right amount of detail in his descriptions, and the writing, overall, has a sense of authority and ease. The narrative voice carries us from scene to scene with a quiet agony that builds with each conversation. By the end, we feel like we know these characters and want better for them than what life has given them." "Straits keeps the reader engaged with dynamic language and imagery throughout the story. His appreciation for language on the sentence-level is apparent, but it never gets in the way of authentically showing us the world from Leo’s point of view." "Taylor does a great job of starting with a high moment of tension—a fight between a couple—and following its impact through the rest of the story. All of the scenes are haunted by what happens in the beginning, and we read on to see how Zoe and Cas’s conflict will find resolution."